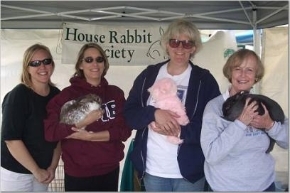 The San Diego House Rabbit Society is an all-volunteer nonprofit organization and depends solely on our volunteers to carry out the mission of our organization. We welcome compassionate and reliable volunteers to assist with a wide variety of needs. You'll have fun and make a difference in the lives of many rabbits throughout our community! To discuss ways that you can volunteer, email volunteer_director@sandiegorabbits.org. Become a hay elf for a few hours on Saturday mornings to pack hay for sale. We also have need of volunteers with a roomy vehicle such as SUV or pick-up truck to haul boxed hay to our distribution locations. Following is the tentative upcoming hay packing schedule. Please note that this is subject to change based on current supply of hay, upcoming needs, and weather. We suggest that you contact the person listed before coming out to help. Bunny Store Hay Packing 9:00 - 11:00 a.m. (approx.). San Diego House Rabbit Society Bunny Store. First and Third Saturdays of each month. North County Hay Packing 8:30 - 10:30 a.m., Escondido. Second and Fourth Saturdays of each month. Foster Homes ALERT! We have a critical need for additional volunteers in this area. We have a need for foster homes that can take one or two rabbits. 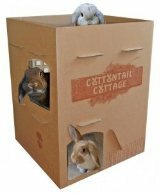 This requires you to house the rabbit indoors according to HRS guidelines, and to make the foster rabbit available for regularly scheduled adoption days. To get more information on fostering for HRS, email hrs@sandiegorabbits.org. A six-month commitment is required for this position. Help out in an HRS foster home with general rabbit care; cleaning cages & rabbit rooms, litterbox changes, grooming, exercise, socializing and feeding. Requires a regular, ongoing commitment and scheduled time/day per week. Training provided. Permanent homes are needed for "sanctuary" status rabbits. Rabbits in sanctuary care need caretakers with rabbit experience. These rabbits may have challenging attitudes or on-going medical concerns, making them difficult to adopt into permanent homes. HRS covers all medical costs and "most" supplies (cage, hay, etc.) to approved sanctuary homes. You provide the love and care, throughout the bunnies' lives. Home inspection required. Email hrs@sandiegorabbits.org to learn more about sanctuary rabbits, and to give one of these homeless bunnies a loving place to live throughout the remainder of his/her life. HRS Bunny Supply Store Assistance: Our Bunny Supply Store in Kearny Mesa is open on the first four Saturdays of each month from 11:30 a.m. to 3:30 p.m. We need helpers for merchandise sales, education, and/or trimming nails, We also need people with trucks or SUV's to pick up and deliver Carefresh, pellets and cages from KW Cages in Santee, to the store. We are located at 4805 Mercury Street, Suite J, in Kearny Mesa. Find our building on the northeast corner of Mercury Street and Ronson Road. ALERT! We have a critical need for additional volunteers at the County's Bonita Shelter. San Diego HRS does not have a shelter, but instead works closely with our local shelters. 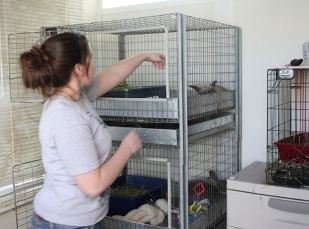 Shelter volunteers clean cages, provide fresh food and water, socialize and exercise rabbits, evaluate personality for rabbits' descriptions on websites, be alert for medical/social problems. Most shelters require that volunteers go through an orientation program. Volunteers must be experienced in safely handling rabbits, trimming nails, etc. Training will be provided to volunteers who can commit to a set schedule. ALERT: There is a crucial need for volunteers in our local shelters and humane societies. If you can help, even if only 2 to 3 hours per week, please contact us. You must make a commitment to be at the shelter on a regular basis, about the same time each week, and go through the shelters' orientation before working on your own. Our presence in the local shelters makes a huge difference to rabbits who might otherwise be euthanized due to lack of space or experienced rabbit caretakers. You really can make a difference! Below is a list of shelters with whom HRS volunteers. 2905 San Luis Rey Rd. San Diego HRS regularly participates at community events such as Earth Fair, PAWS Escondido, Encinitas Environmental Fair, local schools, kids shelter programs and more. Volunteers are needed to staff our education booth at these events. We will pair new people with experienced volunteers, to get them started off right. To learn more about educating the public about the joys of rabbit companions, contact education@sandiegorabbits.org. Before participating in education events, we highly recommend that you spend time reading the San Diego HRS website to become familiar with HRS philosophies and views on rabbit care, spay/neuter, housing, diet, and more. Visit http://www.sandiegorabbits.org/ and click on the links: About Us; Adoption; Behavior and Diet. Many of the volunteer opportunities listed above (rabbit care, bunny store, education events, PETCO stores, etc.) can be performed by older children alongside a parent or adult guardian. Check with us to see if a volunteer need can be met by adult/kid partners. Teens and pre-teens are welcome. Under 16 requires an adult to volunteer with them; all require written permission from a parent or guardian (up to age 18). Not all volunteer positions will be appropriate for our younger volunteers; we will help you figure out where you can help. Kids, become a volunteer with the SNAP Dragons, and be part of helping animals in San Diego County. For additional information on Volunteer Opportunities with San Diego House Rabbit Society, listed by time commitment and interest, visit Volunteer Match and search for San Diego House Rabbit Society.